Photographic Story While photographing Algarrobo 1, I decided to also photograph the banana plantation that was in the shade of the tree. As I was photographing the farmer, who worked the land, came up to us and wanted to know what I was doing on his land. 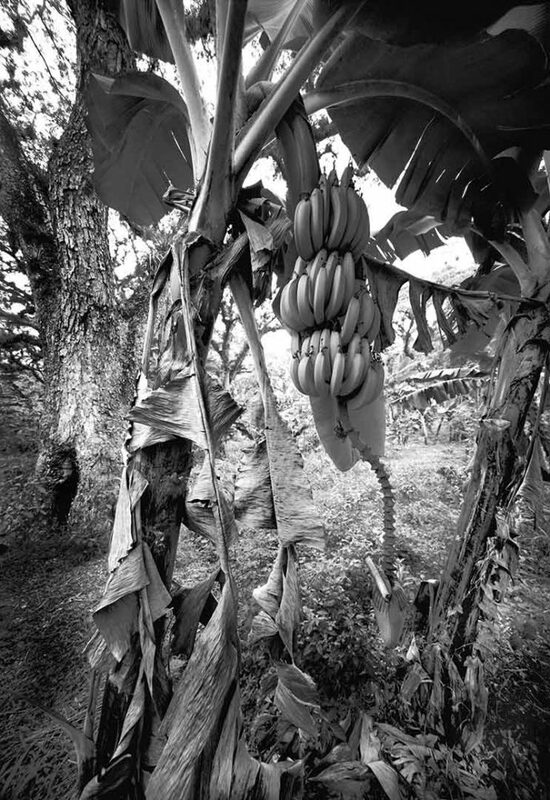 The interpreter explained that I was a photographer and that I was taking photographs of his bananas. I invited the farmer to take a look under my dark cloth. The farmer had never seen a large format camera and spent a very long time under the dark cloth trying to figure it out. Since my interpreter didn’t know anything about photography he couldn’t explain through the interpretation what it was I was doing. It was an interesting experience. Digital – Archival Pigment Print This photograph was taken with an analog large format camera. After Clyde develops the negative, the film is scanned and edited in a computer program mimicking his darkroom techniques. The photograph is printed on an Epson Stylus 4800 or 11880 printer. Clyde uses archival Ultra-chrome K3 ink and prints on archival Harman Hahnemuhle paper. The limited edition photograph is then mounted and matted to current archival standards. This is a limited edition series and each photograph is numbered.